Our luxuriously classic herringbone design is sure to become a versatile addition to any wardrobe adding texture, style and color to coats, tops and sweaters. Hand woven, it is crafted from 100% baby alpaca wool, certified pure by the International Alpaca Association. Thicker and denser than others, it provides the ultimate thermal warmth. With scarves that are not only classic, cozy, and completely on trend, Inca Fashions sets a tone that is sophisticated and timeless at the same time. Our sought-after pure baby alpaca scarves are created from only 100% natural baby alpaca - delicately spun and expertly woven into a durable yet fashionable scarf that will chase away the chill of the coldest days. Alpaca, one of the most durable natural textiles is long lasting and will grow softer with use, while still looking fabulous. Alpaca, and particularly baby alpaca, makes a treasured gift, perfect for anyone - especially those who are hard to buy for! Once only available to royalty, baby alpaca is a gift that shows just how special the recipient is. Alpaca does not absorb moisture, or odor, nor will it water spot, or pill. Wrinkles will fall out if hung over a hanger overnight, providing a fresh clean put-together look. To clean we recommend dry cleaning at the end of the season. Store it in a breathable container with cedar or lavender to protect the luxury fibers during off seasons. Our luxurious herringbone scarf is sure to become a versatile addition to any wardrobe. A classic style in all natural, timeless neutrals or fresh modern color sure to chase the chill away. Highest Quality - Certified 100% pure Baby Alpaca by the International Alpaca Association. Tightly woven this scarf will provide the best of alpaca's unique thermal warmth. 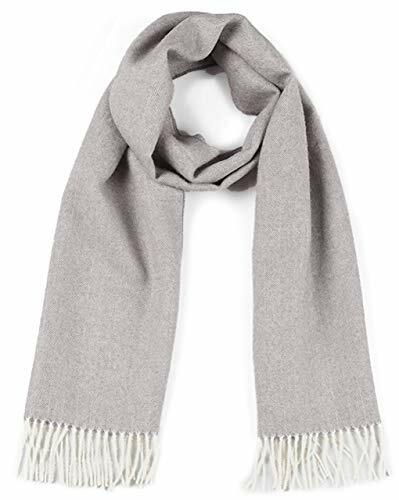 Classic sizing - 72in X 12in with 3 inches of hand rolled fringe - perfect for wrapping around the neck multiple times or tying for a traditional scarf look.